Comment: I am seeking a mason who can replace the stone coping which surrounds an inground pool. Comment: new walkway using paver stones ? Comment: Need repairs and a few replacement bricks for front path. 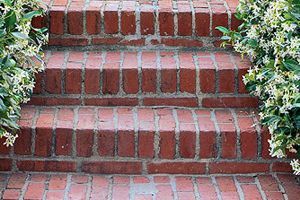 Need bricks repointed and cement filled on front steps that are slate. Email preferred initially. Comment: I need a 18' wide by 40" high section of 8"x20" stone veneer interlocking panels installed. This would also require a metal mesh and masonry skim coat applied first. Both ends of the section just need to be squared off, (no corner pieces involved). There will be 6 pieces of 3"x36" stone cap installed on top. This my already be in place depending on the timing of the crew doing the vinyl siding. Johnston Brick & Stone Masonry Contractors are rated 4.73 out of 5 based on 302 reviews of 16 pros. Not Looking for Brick & Stone Contractors in Johnston, RI?